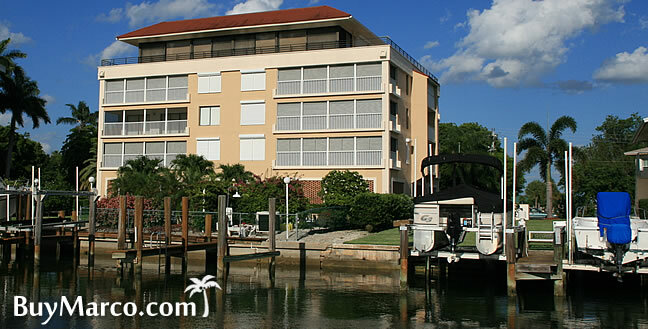 Panama Club is a low-density building on the South End of Marco Island. There are only seven units in this five-floor condominium. The amenities that Panama Club offers include a heated swimming pool, deeded boat dock and parking garage. The popular Ten Thousand Islands area is a nearly 100-mile long chain of islands and islets. With a boat in the back yard, owners can be exploring and fishing the islands in no time. Not only is Panama Club a boating condo but it's a walk-to-beach condo as well. So, it's definitely got something for everybody. All of the units have plenty of storage space and bright open plan interiors for enjoying the Marco Island sunshine. At 1,900+ square feet, the condos have plenty of room for settling in and watching the birds fly by. Atop the building is one big penthouse. Monthly maintenance fees for Panama Club condos is $757. For a condo with on seven units, this isn't too bad. Without the economies of scale that larger condo properties enjoy, smaller condo complexes usually can't negotiate the same low rates on things like "hurricane insurance." No pets are allowed at Panama Club. Smaller pets are allowed at many Marco Island condos, though. Our Condo Comparisons© outlines which condos allow pets and the weight or height limits. If you have a big dog, your condo options are slim but the Villas at Waterside and Bayfront Place take pets up to 50 lbs. Most condos on Marco Island set minimum rental periods of 30 days, Panama Club is one of them. Striking a balance between continuity of neighbors and rental potential is tough. Thirty days seems to be a consensus that satisfies owners that don't want renters in their building at all and owners that would like to earn a little income on their investment. There are two different floor plans in Panama Club. They are both three-bedroom and penthouse plans. Click here to see all Panama Cluba floor plans. Affordably priced and complete with several modern updates, the Panama Club is ideal for becoming that winter season home away from home or even making it a permanent residence. Now, living in a lush tropical area, which is completely private, is open for the taking. Come and see for yourself how much these cheerful condominiums have to offer.